Clara Jane Cow was an unfortunate name for a child. But it wasn’t anyone’s fault. Her great-great-grandfather had come across the sea in a creaky boat from Lithuania, and in Lithuania ‘Cow’ was a fairly common name. It meant ’tiller of black soil’ and was properly pronounced Gov. The problem was, no one in North Carolina knew that. When the first letter for the great-great-grandfather arrived, from his dear old mother in the steppe, the postmaster took one look at the envelope and laughed so loud that the birds were startled from their roost under the post-office roof and the rafters dropped dust into his wide-open mouth. The news spread like wildfire, because of course when someone laughs everyone wants to know why, and before anyone even had the chance to meet Yigur Cow and learn the truth about his surname, the whole town had made up its mind. Yigur Cow was one of those loping, good-hearted men who expect other people to be the same, and so when folk at the general store or by the hitching posts shouted after him, “Hey! Hey, Mr. Cow!”, he thought they were simply being very friendly and chalked up their terrible pronunciation to inferior schooling. He never quite realized what the problem was, and nor did his wife. But their children did. And their children’s children did. And now it was Clara Jane’s turn to notice. If, in the past eight years of her life, things had been different, if she had been born into a family that was not named Cow, if she had a regular, pointless name like Wheeler or Charleston, if the other children at the little school by the brook had not teased her, if she had not climbed up into the hayloft of the Cow barn and cried until she couldn’t stop, well then, she may never have found the djinni. But she did, and so it happened. The djinni was kept in a small, regular-looking wooden box – it might once have been a sewing box – shiny, and worn smooth from a hundred years of leathery, lye-soaked fingers. The wood was dark, almost black, with shades of cherry just peeking through where the varnish still clung. There was a keyhole, and no key. Clara Jane had no idea it was there. She was having a good cry. 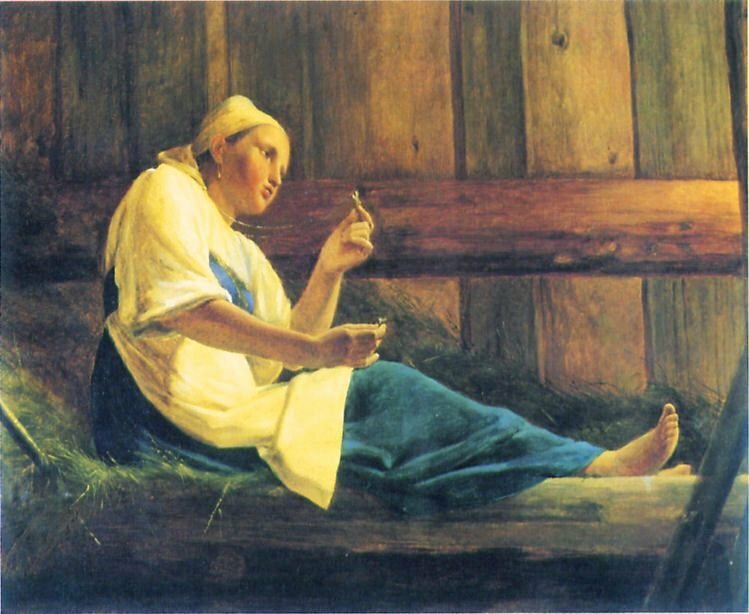 She was rolling about, mourning the day of her birth, and the hayloft being what it was, scratchy stalks of dry grass were getting into Clara’s dress and makingher cry more; it was as if the straw were in league with the horrid children at school, as if everything, the very universe, were conspiring against her. She stood up after a bit and began to pace, still sobbing, and after another while a particularly harsh stab of sadness and shame overtook her and she threw herself down in a comfortable-looking heap of hay. . . . and landed on the djinni’s box. Right on the corner. She sprang back up with an indignant cry, because now she was sure the world was simply one great cruel thing that would not even let her weep without hurting her. She spun to look at the heap of hay, rubbing her back where the box had bit into it. She saw the djinni’s box. Just the corner, dark and silent, poking out from among the gold and dull green of the hay. . . I will tell you right now that this is not a wishing story. It is not the sort of story where you know what will happen, and where you can nod wisely as all of Clara’s wishes go terribly wrong and think how she really should have been more content, because who cares what your name is anyway? Clara Jane cared, for one. She cared a lot. And there was no one who could have told her it was not a bad thing to be called Clara Jane Cow without her spinning about and laughing loudly in his face, and then punching it, too. It is bad, she would say. You try it. No, this is the story of a girl, and a djinni who had run out of wishes. The djinni had a silky voice, like ink and oil, and as it stood there, hovering, its lower extremities tapering into shadow, it eyed Clara. It was dark and vaguely boy-shaped, and though it was constantly shifting, a thousand strands of night and starlight, it was not frightening. Mostly because it looked terribly depressed and morose. It practically dripped self-pity. “I suppose you want a wish,” the djinni said, and Clara Jane’s mouth dropped open. She wasn’t surprised that it spoke. Djinni’s were supposed to speak. She was surprised that it was such a stingy, grotty djinni. “Aren’t you supposed to give three wishes?” she asked. In her mind, she added that to the long list of injustices her life had seen. A wish, not three, like in every fairy story she had ever heard. “Oh, I would if I could, but someone else used them all up. So in fact, you can’t have any. But I thought I’d ask, for politeness sake.” The djinni sighed, its chin coming to rest on its shadowy chest. Apparently it was done eying Clara. Another mark on the tally. Clara felt a sob creeping up again, all the hot, bitter tears that had not fallen yet rushing up again. They were not for the defective genie and its lack of wish-granting, no, but she had not been anywhere close to being done crying before. This encounter seemed only to highlight the plight of her life. She took several quick, gasping breaths. She couldn’t very well cry now, with this sad-looking creature hovering about, watching her. She wanted it to go away. She picked little bit of hay nervously from her dress. Clara Jane’s gaze turned sharp. If she told him why she was crying, she would have to tell the djinni her name, and then it would probably laugh. The djinni spoke in a slow, drippy voice, never sounding as though it were terribly interested in the answers she might give. Clara thought for a moment. What would she wish for, if she were not the unluckiest girl in all the world? Many things. A new name. A new face. A new house, far, far away from here. “You’re grinding your teeth,” the djinn observed, turning its head aside to stare tragically at a beam of sunlight. Clara stopped. She took a step toward the djinn. “About what?” Clara said despondently and sat down heavily in the hay next to the box. The djinni dropped its voice low and began to tell a tale. It started very boring, Clara thought. There were endless-long sentences about the sky and the color of the tiles in a courtyard, and the sound someone’s voice made when it rose, and the colors some improbably perfect girl’s hair took on when when the light changed. (So many colors – crimson, chestnut, auburn. Clara did not think it possible that one person’s head of hair could change so often without the help of wigs or dye, but the djinni sounded quite convinced). Clara Jane yawned expansively which threw the djinni off for a moment. But then there came a line, just one sentence, and suddenly Clara was listening. The line was about the main character of the story, the improbably perfect girl. She had been kidnapped from her parent’s home and taken far away, and while Clara had instinctively disliked her a second ago, that line came and went, and Clara found herself interested, almost despite herself. The line was this: but Esmerelda did not want to be betrothed to the horrid Jezra, the shifter, the poison-slinger, and nor indeed did she wish to leave her beautiful home forever, and so she fled to the highest tower of Jezra’s castle and tried to think of a way in which she could dodge her fate. Clara Jane Cow was, as usual, very frightened when she went to school the next day. She dreaded it most awfully on her way down the rutted road. She practically shook all the way through class. And yet, somehow, it was not quite so bad as the day before, and the day before that. Now, when the teacher rang the bell and the children spilled like roaches out of the schoolhouse, Clara went and sat by the brook and thought lengthily about the girl Esmerelda and how she would escape the wicked monster Jezra, to whom she was to be betrothed. (Clara didn’t know what ‘betrothed’ meant exactly, but it was clearly an awful thing.) And as soon as the teacher dismissed the class, Clara sprang up and ran all the way home, and it was not that she did not hear the screams and taunts of the other children, because she did, but they were not all she heard today. There was something else now, and it was almost as important. As soon as she was back at the farm, she threw her books down on the porch and climbed the creaking ladder to the hayloft, and opened the djinni’s box and listened in the dark as it spun Esmerelda’s tale, on and on, the strands of it floating into her mind, and deeper. Clara’s mother came and poked her head through the barn-door, but all she heard was Clara’s quiet breathing and an occasional laugh, and a very soft voice which may have been Clara’s own, whispering. When Clara came down she was very happy. The djinni continued Esmerelda’s story for one hour every evening after school, and not a word more, though Clara begged for more and tried to bribe the djinn with gingersnaps and apples. (To no avail.) The story went on and on, and Esmerelda got into an alarming amount of trouble for one person, but she was clever and brave, and she usually found a way out of it again. As for Clara and the djinni, they could not help but become quite good friends, though the djinni was still very sad over the fact that he could not grant wishes. And Clara looked at the djinni from where she was resting her head on her hands and smiled. She didn’t say it, because she didn’t quite know how, but her smile said, It’s almost the same as granting wishes. In fact, maybe it’s better. Esmerelda finally escaped the clutches of Jezra and was promptly captured by thieves. Clara was both inconsolable and jubilant at the same time. Clara’s parents decided, in a doting way, that she was slightly mad. Her peers, in a less doting way, decided she was tedious and insufferable. She cared not at all for either opinion. One day, she came home from school and scurried up the ladder, only to find all the hay gone and the dim loft full of furniture. A strange man was clattering about, setting up a brass lamp. That was the end of the djinni. Clara looked, far and wide, as hard as she could, but she never found that old box with its shiny wooden sides and hint of cherry. She cried for many nights, convinced she would never know the end to Esmerelda’s story, whether she would escape the thieves, whether she would find her way back home, and be happy again. Clara felt she could never leave her room again, never go anywhere. What good was it, when there was no story and no silly, mournful djinni to tell it. The thieves lived in a cave, in the heart of a mountain made of bones, and that was where they took Esmerelda, though she fought them with all her might. . . It was not the same as when the djinni spoke. She was worried she would get it wrong. But after a while she realized she couldn’t get it wrong, even if she tried. It was her story now, and she could make it any way she pleased. Clara Jane Cow never changed her last name. And people never stopped laughing at it, not even when she was eighty-nine years old, living in a mustard-y old house in the middle of a cornfield. But when they did laugh, she would simply stare at them, and then she would go away through her rooms full of books, and while you would never see, you could hear a silky, oily voice telling the most marvelous stories you ever heard.